We frequently get calls regarding Saltillo. Most people refer to all clay type tiles as Saltillo. The 2 most popular clay style tiles is the true Saltillo and D’hannis. Saltillo is pillowed and manufactured in Saltillo, Mexico. D’hannis is flat and manufactured in D’hannis, Texas. Both D’hannis and Saltillo floor restoration procedures are generally speaking the same. Over the years, contractors and home owners have applied many products for top coats. One common misconception is that waxes are a good way to seal the surface. Although waxes are good to use, they don’t seal the tile. 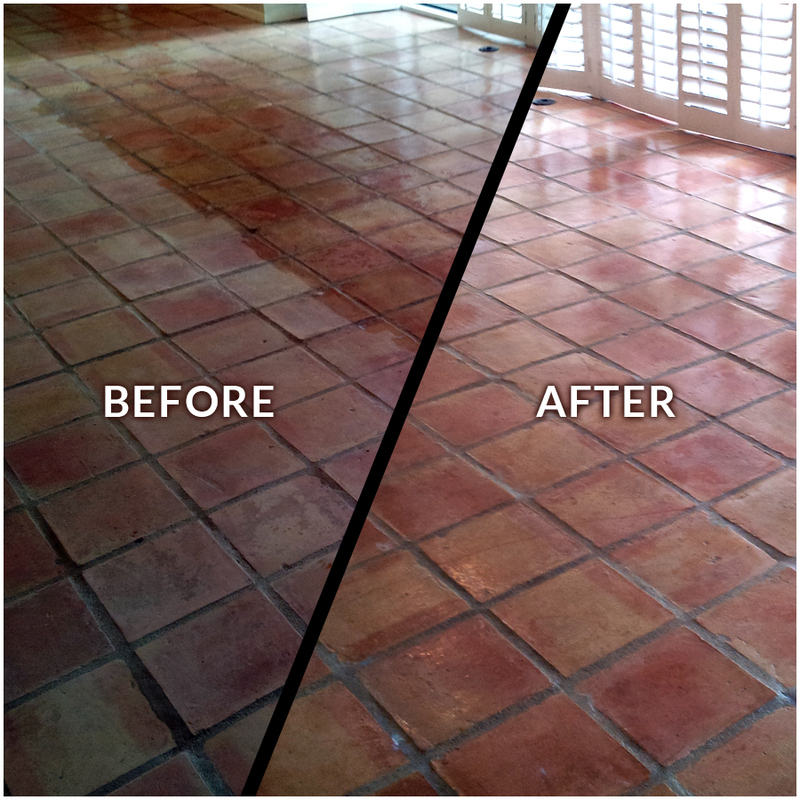 Waxes simply provide a sacrificial surface to protect against physical damage and should only be used over the top of a quality sealant to protect the sealant after Saltillo floor restoration is completed. 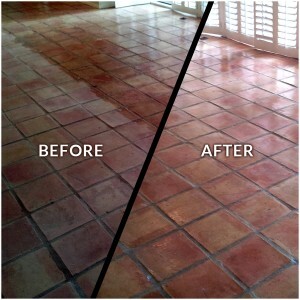 There is also some benefit to re-waxing a sealed Saltillo tile every 1 to 3 years. The pictures shown here is a Saltillo floor restoration we finished with a quality solvent based top coat mid way through sealing and at the completion of sealing. Do you have a concrete patio you wish to add color to? Do you already have a stained concrete floor on your patio that is needing some help? We’ve got answers. We recently handled just such a situation. Our client purchased a house and the patio needed a lot of help. As you can see from the picture, the previous stain was failing in a way that required full restoration. We normally aren’t able to remove as much of the previous stain, but in this case it appears that it wasn’t prepped and/or sealed properly for an outside stain. In fact, we re-stained the inside as well but it didn’t come off as completely as the porch did. Beyond just the need to correct the concrete stain it had another dynamic. The outer, uncovered section was poured at separate time from the covered section. Perhaps you’re wondering why this matters. 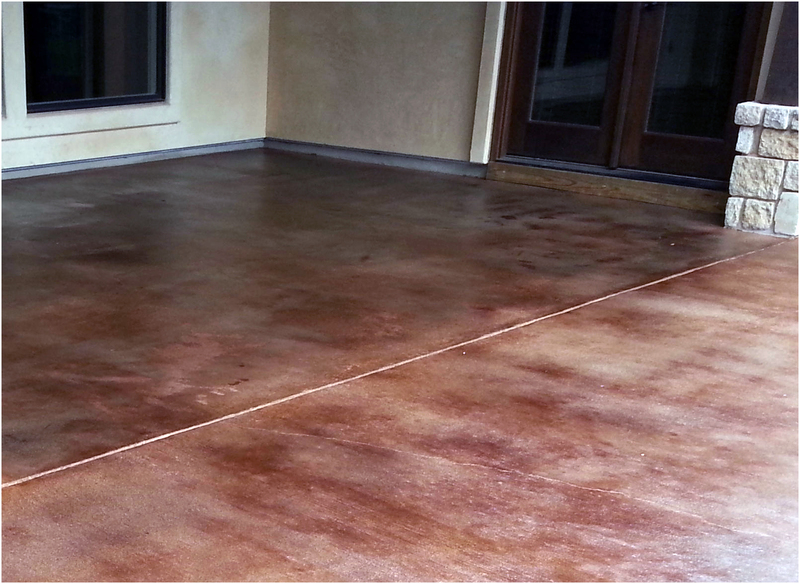 Depending on the type of stain used, it can have significant difference in the consistency of the stained concrete floor color between the 2 different pours. This is exactly why we use water based or polymer based stains. The one drawback to using these polymer based concrete stains is that you can’t get away with low quality sealers. We use urethane based sealers so this isn’t a problem when we stain concrete. Urethane acrylics and polyureas create excellent bonds with the stain and the concrete because they have like properties. We also have a 2 component polyurethane blend we use when the circumstances require it. Our sealers also have a high level scuff and scratch resistance as well as being highly cleanable. Going forward, these polymer based sealers can be recoated when prepped properly. Depending on wear, they will need to be re-coated every 2 to 5 years. 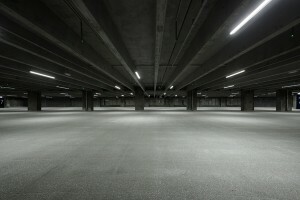 Decorative concrete coatings are increasingly becoming more popular in garages. Home owners have a number of “do it yourself” options but are generally unaware of problems related to epoxy garage floor options available. A common problem with most garage coatings is what concrete contractors call the “Hot Tire Affect”. Some tires are more prone to cause problems then other tires because of the makeup of rubber in the tire. As a car with hot tires parks on the coating, material(s) in the tire creates a chemical bond with the coating. The tires cools with the coating bonded to it and when driven the next time it removes the coating from the concrete. There are many options for the top coating, though the concrete industry recognizes the 2 component polyurethane as the best protection. The 2 component polys are not affected by hot tires and are resistant to most chemicals in the typical home owner’s garage. The only problem is that polyurethanes don’t bond with concrete so they can only be used as a durable, chemical resistant top coat over an epoxy garage floor or acrylic garage floor decorative coatings. 2 component epoxies provide the best bond to concrete as well as offering hot tire and chemical resistance. Epoxy garage floors are also used as a base for broadcasting decorative vinyl flakes as well as other decorative media depending on the look desired. The vinyl flake is widely used as the media of choice for garages then top coated by polyurethane for protection. Acrylics also provide an excellent bond to concrete but don’t offer the best protection against hot tires so they too would require polyurethane. The full broadcast vinyl flake epoxy garage floor has been the staple in the industry for many years but come with a high cost of materials for this reason, at Tile & Stone Nerds we partnered with one of our manufacturers to create an acrylic system to resemble the vinyl flake epoxy garage floor with a more competitive price point. Both systems are top coated with the same 2 component polyurethane so they both offer the same hot tire and chemical resistant protection. Travertine is popular natural stone in central Texas because of its price point and options with color, surface reflection and texture. Because it’s a relatively soft stone the surface reflection or level of shine can be easily manipulated. The main problem with travertine is etching due to its acid sensitivity and there are many acidic products in the typical house that can cause etching. It is this etching that generates the majority of maintenance problems with travertine flooring. A common description we get from homeowners regarding the etching is that the travertine has “water spots.” I am frequently asked if it can be cleaned off. Unfortunately etching causes physical damage to the surface of the requiring travertine polishing to restore it. There is a number of travertine polishing processes we can use and can usually restore damage caused by etching it to a factory hone with 1 honing step. In addition to etching problems travertine is subject to wear patterns in traffic lanes. The higher the polish, the more visible wear patterns and etching are and the more frequent maintenance work is required to maintain its desired look. Typically wear patterns can also be removed with 1 honing step just like etch removal. We can achieve a high polish with depth and clarity from a factory hone condition. This means travertine can be restored and polished with just 2 steps. 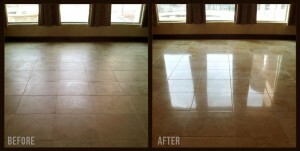 Travertine polishing is generally needed every 3 to 5 years. The depth and clarity of travertine polishing is greatly affected by the quality of the stone. Travertine resembles Swiss cheese in that it’s full of holes. Those holes are typically filled with cement or grout based product that will not take a polish. Higher quality travertines have fewer holes and the holes are filled with polymer based product that will take a polish. Regardless of the type of fill, no travertine will polish evenly like marble or granite.